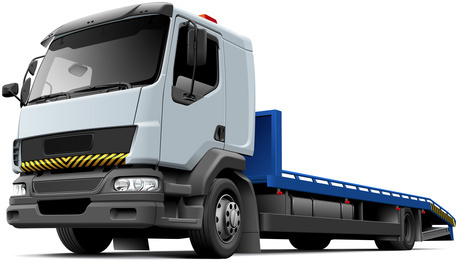 Given the operating dynamics of a truck manufacturing business, which often involves transportation of trucks from one place to another, it is important to ensure the safe delivery of the product. In addition to finding a professional truck transport services provider, having some basic understanding of the types of trailers used for transportation, can help service seekers make an informed decision. The post lists common types of trailers used for trucks transportation. Flatbed, as the name suggests is a flat deck style trailer, idle for transporting trucks and cargos that can’t be loaded or unloaded from a dock or too big to fit in a standard truck trailer. These trailers allow the use of cranes and forklifts for loading and unloading goods from sides, top, or rear. Flatbed trailers are typically 48’ long and 8’5” wide, with varying deck length categorizes, such as step decks, double drops, and removable goose necks (RGNs) and can accommodate the weight up to 96,000 lbs. Flatbeds trailers provide dimensional flexibility for large freight, as they don’t have any physical walls. Also called a drop-deck trailer is a two deck level trailer. While the upper deck can be used to carry cargo just like any standard flatbed, lower deck is a great substitute for hauling taller cargo. The lower deck is 3’3” off the ground as compared to standard flatbed (upper deck) which is 4’8” off the ground. Just like a flatbed trailer, step-deck trailer too can be loaded from any side, the only difference is that they can accommodate a cargo of height up to 10’. Extendable step deck or stretch trailers or trombone trailers are an excellent choice for hauling freight that is too long for a standard flatbed trailer. These trailers can legally carry shipment 48’-80’ long, but with the maximum weight rating of 45,000lbs. Removable gooseneck trailers are used to carry tall and long loads. As the front of the trailer is detachable, the trailer falls on the ground forming a ramp. The ramp form of the trailer makes it easy to load heavy machinery directly onto the deck. Gooseneck trailers range from 3-axle to 20-axle with a transporting capacity of the weight up to 150,000lbs. Lowboy trailers, also referred to as double-drop trailers, that’s because of their resemblance to a step deck. They are an ideal choice to accommodate tall shipment with cargo height of up to 11’6”, such as industrial equipment, and bulldozers, as the top deck is only 18” above the ground. They can also be used to transport large trucks.